Ever wonder what goes underneath a swingset or at the bottom of a play pit? It’s playground flooring - playground flooring specially designed with safety and shock absorption in mind to keep kids active and safe, and parents worry-free. Being on your feet all day can take a toll on your body. If your occupation requires you to stand or walk for long shifts, there are basically two ways to survive – strong, durable rubber flooring that relieves some of the fatigue, or fugly orthopedic shoes. 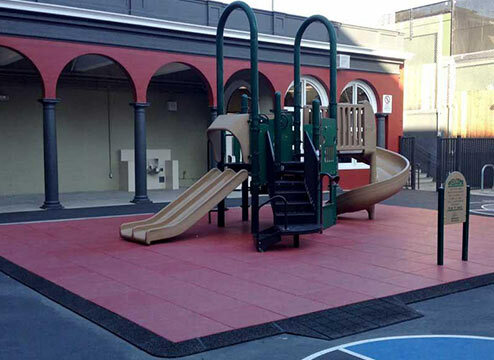 Playground Flooring is available in rubber tiles, mulch, mats and synthetic turf. If you’re new to playground flooring, it may be intimidating figuring out where to start. Let’s break it down. Safety is always number one. For playground flooring we talk a lot about “fall height”. Fall height is the highest point a child can safely stand on. Fall height is determined by testing the shock absorbency of the flooring. The short story is that something like concrete would have almost no shock absorbency – you would not want your (or anyone’s) kid falling from tall playground equipment onto hard concrete! Thick, shock absorbent playground flooring is specially designed to keep kids safe at varying heights, so there is an option for every need. The safety, fall height and shock absorbency is determined, mostly, by the thickness of the playground flooring. In short, thicker tiles/mulch = higher fall height, meaning you can use higher playground equipment. Because safety is such a big concern, it’s super important to be diligent and make sure your flooring meets the safety standards. Tiles, mulch and turf each have their own standards and safety criteria. Playground tiles are the most popular safety surfacing we sell. These tiles come in many different colors and thicknesses. Because playground tiles are porous, they allow water to easily penetrate through the floor, ensuring a dry playing surface even after a heavy rain. Maintaining your playground tiles is also a breeze. All you need is a blower and a garden hose or broom to bring them back to their original glory. Because safety is such a big concern, it’s super important to be diligent and make sure your flooring meets the safety standards. Tiles, mulch and turf each have their own standards and safety criteria. Safety: Playground tiles provide a safe place for children to run, jump, and even fall while at play. 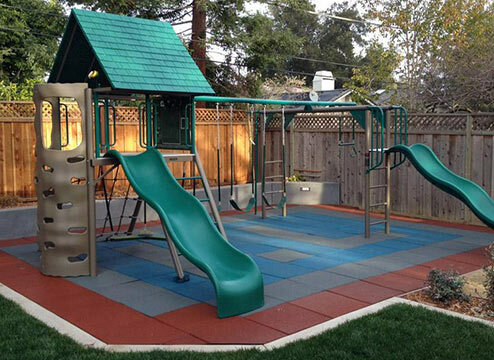 Looks: No need for gallons of dirt or rocks, playground tiles are a great way to create an attractive play area. Comfort: How many times as a kid did you get a rock in your shoe? Rubber playground tiles keep kids comfortable. Expense: Rubber playground tiles are expensive, but we feel like safety is worth the investment. One of the first things you want to consider when picking a playground tile is the fall height rating. This rating is determined by the density of the tile. It’s also commonly associated with tile thickness. A general rule of thumb is, in most instances, the thicker the playground tile, the higher the fall rating. What is a fall height rating? Well, that is a rating given to a safety surface and indicates the height in which someone can fall before they get seriously hurt. So what are some typical fall height ratings? Below are typical fall ratings for various tile thicknesses. So, in shocking news, heavy rubber playground tiles can be kind of a deal to ship. Not a big deal; more like a small deal, but a deal nonetheless. Like I’ve said, we’re not about you spending extra money, which is why we ship out of east coast and west coast locations– to keep your costs and your waiting time as low as possible. 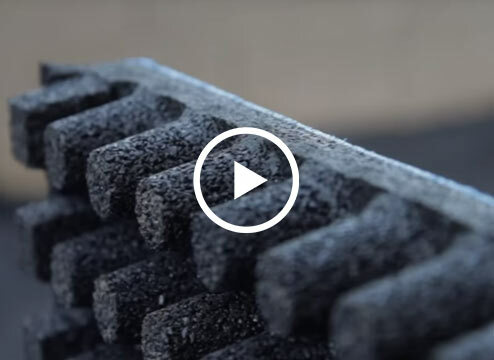 You’ll definitely want to check the manufacturer’s recommendation for installation, but we also have a great video for how to install playground tiles! What is Playground Rubber Mulch? 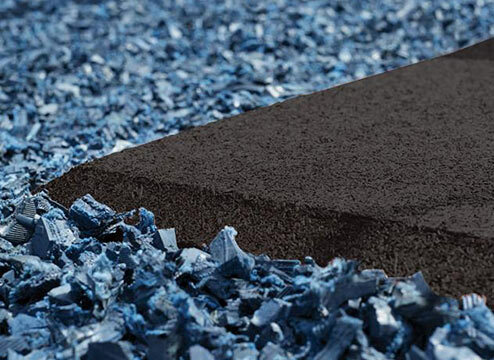 Recycled rubber mulch is made from 100% recycled car tiles, keeping them out of the landfills. Recycled rubber can also be found in rubber mats, tiles, and rolls, so it’s a common practice. Rubber mulch is usually used as playground flooring to keep kids safe while at play. It’s attractive, comes in many colors, and won’t absorb water or blow away like wood chips. It’s also super easy to maintain. Just blow off leaves, or spray with a water hose to clean. Safety: For kids on playgrounds, rubber playground mulch keeps them safe when they’re being daredevils. Never worry about hurt kiddos with rubber mulch spotting them. Looks: Rubber mulch comes in attractive colors that you can choose for your space. 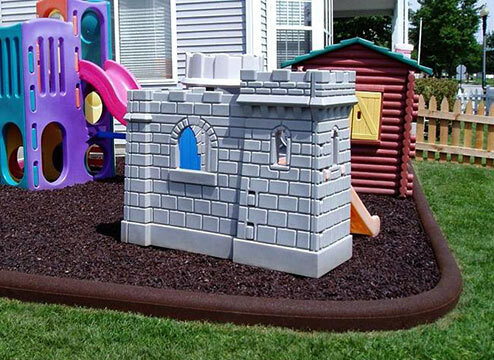 Long-Lasting: Since rubber mulch doesn’t break down, your playground area will look great all year around. Expense: Rubber mulch is more expensive than wood chips, but it lasts a lot longer. Mess: Inevitably kids might play so hard that rubber mulch gets kicked out of the playground area. You’ll want to sweep these back in as that happens. Rubber mulch can be filled to any thickness. Below are thicknesses and what they are typically used for. If you’re buying rubber mulch in bulk, it’s going to be heavy. Luckily our mulch ships from the east coast, west coast, and midwest to keep the shipping costs down. In order to install rubber mulch properly, you may need a few extra materials. If you’re looking for something durable while your children are at play, our playground mats are the way to go. While children are playing, playground mats have their back as they jump, climb, swing, and slide on their playground. 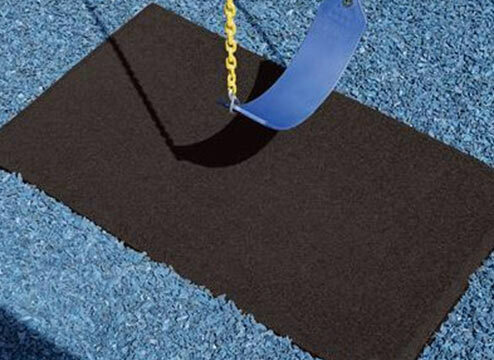 These mats are primarily used under swings and slides, but can be used anywhere kiddos need an extra surface. Safety: Not all playground mats are fall height rated, but some are. For the ones that are, these mats add a little extra protection for your kiddo. Durable: Rubber playground mats tend to be very heavy. That means once you place it, it’s not going to slide out from under your kid during a hard stop. Fall Heights Not every playground mat is fall height rated, so be sure to check the details if you’re looking for extra cushion. Surface Area Safety: Even if a playground mat has a fall height rating, the surface area is pretty small for a fall. It’s best to have a bigger surface area to ensure safety. If you’re buying more than one playground mat, it’s going to be heavy. No worries, our mats ship from the east coast, west coast, and midwest to keep the shipping costs low. 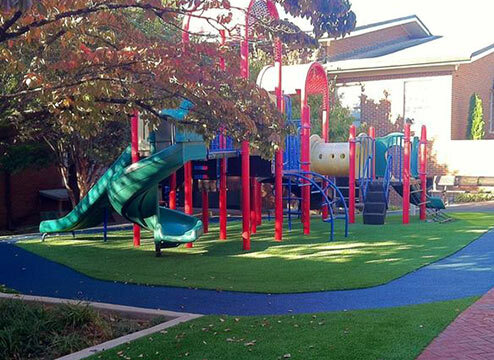 Playground artificial grass often mimics real grasses that are found throughout the United States. Playground turf is super UV stable and also heat and frost resistant. It typically has a higher face weight and more durable fibers than other types of turf. Both of these factors make playground turf extremely durable for the playground. 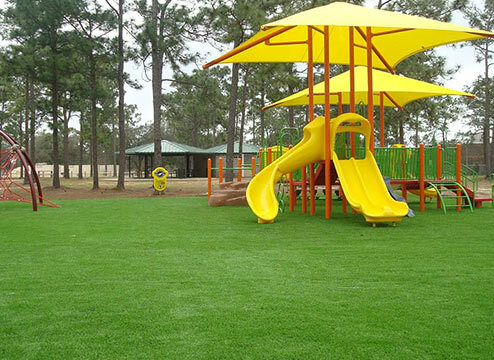 Playground artificial grass is usually made from polyethylene or polypropylene. This fiber can hold a lot of wear and tear compared to other types of outdoor playground flooring. Safety: With play padding underneath, your playground turf doubles as a safety zone for your kiddos. Eco-Friendly: Artificial grass is made of recycled materials and has a measurable, positive impact on the environment. It requires no watering. Maintenance Free: No watering and no mowing, what’s better than that? Looks Real: Playground turf also has the added benefit of looking like real grass. Expense: It’s certainly an investment, but long-term, you save money. Heat: As the temperature rises, so does the artificial turf grass. There are ways to keep the temperature down, but artificial grass is hotter to the touch than real grass. Playground turf has different fall height safety ratings, depending on thickness and underlayment. The thickness is measured by adding the thickness of your lawn pad or play pad with the thickness of your playground turf. 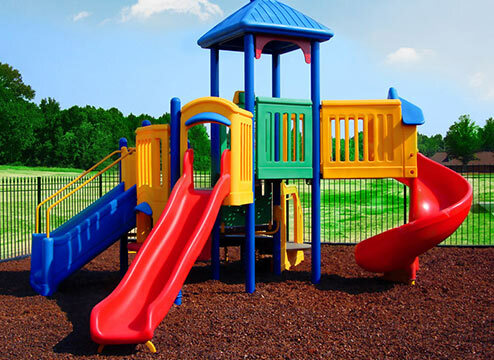 It is important to note: these are the standard ratings, but playground flooring safety ratings vary by product, so make sure to check out the specs on the specific product you are looking at to ensure it will be safe. Our playground artificial grass ships from the midwest, west coast, and east coast. To install, you’re going to need a few accessories. Luckily, we have them available for you to buy now. No website hunting needed! Weed Fabric: You don’t want weeds and grass poking through your playground. You’ll need to lay this down first. Fill: Fill helps hold your turf down and keeps the blades standing up for a natural look. Staples and Nails: Nails are used to hold the edges of the turf down, while staples are great for holding seams together. You’ll need both. Seam Tape and Adhesive: If you really don’t want staples, you can always use seam tape to stick turf together. Easy as pie. Wonder Edge: Edging can help make your turf look it’s best. Lawn Pads or Play Pads: For some extra cushion under your feet, lay down a lawn pad. If you have some kiddos running around, some of these are also fall height rated for safety. In order to make sure everyone can enjoy playtime, we offer ramps that both help eliminate tripping hazards and are also ADA compliant. Ramps- Typically not ADA compliant but are at the 1” level. Helps eliminate tripping hazard. ADA Ramps- ADA compliant. Allow easy access for disabled individuals.